Here are just a few of the more Advanced Heat Embossing Techniques. Click on any sample for a larger view. Some of these techniques may be hard to view in a photo. View available Embossing Powders & Supplies. Color in a design already heat embossed, using markers colored pencils or chalks. Brush or sponge clear embossing ink from the pad onto the colored areas of the design. Pour on clear embossing powder and heat. You have now double embossed the stamped image. 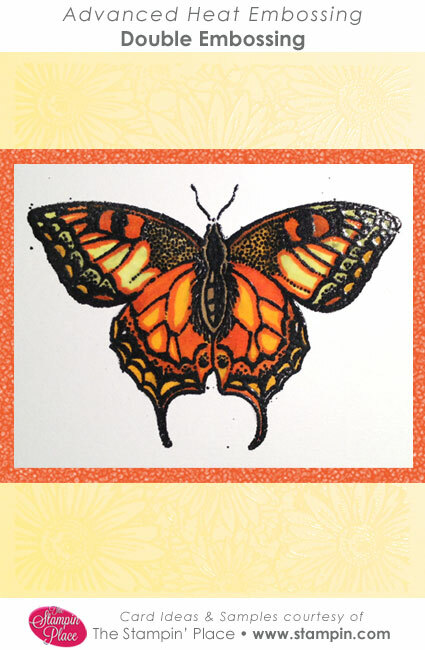 The double embossing technique is shown on the butterfly design in this sample. 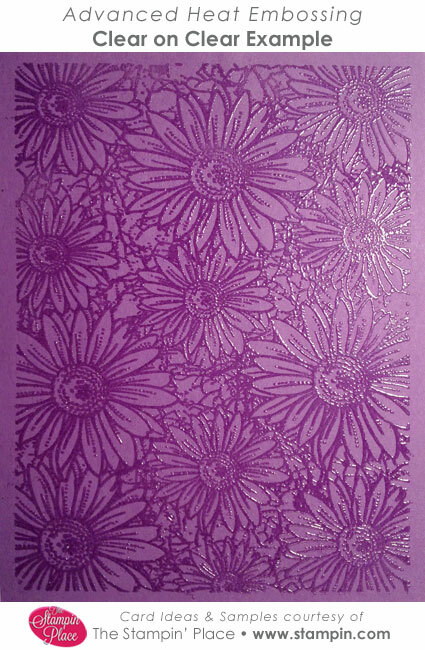 (Looks great on darker colored papers) Using clear or slightly tinted embossing pad, stamp your image on colored paper. Use clear embossing powder over the clear inked stamped image and heat emboss it. You now have a subtle, yet elegant looking stamped image that shows through the color of your paper. The clear outline of the embossed image will catch your eye against the colored background of the paper you have chosen. 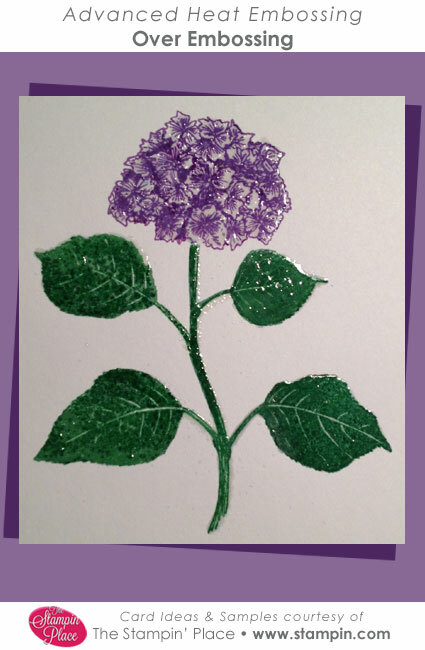 Sprinkle clear or clear enamel embossing powder over your stamped and colored image. Heat from underneath your paper source until the powder has completely melted. Continue steps 1 and 2 until you have built up a shiny, smooth, clear surface that resembles lacquer. Ink up your art-stamp, a clear embossing pad is ideal so the image stays wet longer, as you will be using two or three different powders before heating. Pour the first color on only a part of the stamped image and shake off the excess. While the ink is still wet, pour a second color powder on the remaining part of the design. Each new color will not stick where there is already powder. You won't contaminate your colors. Shake off the excess and heat the entire image to raise the surface. Now you have a rainbow effect with different colored powders used on the same design. Apply marker all over area to be stamped. Allow to dry completely. 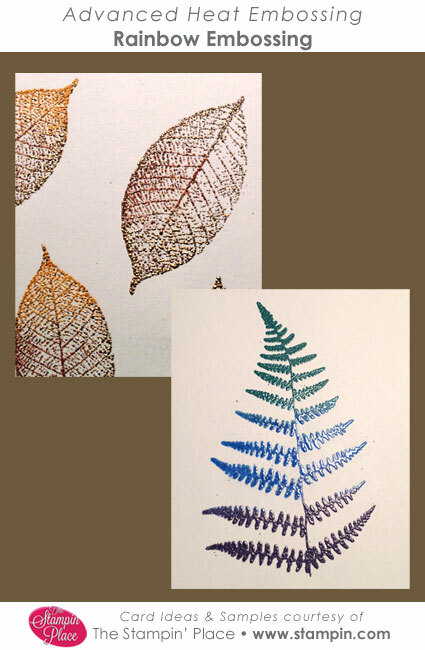 Stamp an image on colored area using clear embossing ink. Heat emboss with clear powder. Sponge black over design.